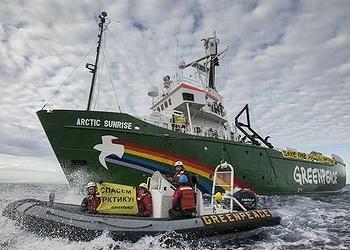 AMSTERDAM, The Netherlands, August 26, 2013 (ENS) – The Greenpeace icebreaker Arctic Sunrise will leave the Kara Sea and the Northern Sea Route today under threat of force from the Russian Coast Guard. Four members of the Russian Coast Guard boarded the ship without permission today after Greenpeace activists launched inflatable boats with banners reading “Save the Arctic” near the oil exploration vessel Geolog Dmitry Nalivkin. 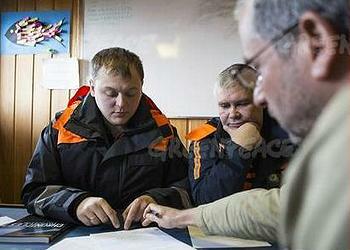 During a two hour meeting on board the Arctic Sunrise, the Russian Coast Guard officers repeated the claim that the ship entered the Northern Sea Route illegally – a claim that Greenpeace disputes. The Coast Guard warned Captain Daniel Rizzotti and the crew of the Greenpeace ship that it would use force if necessary, including opening fire on the ship, if the Arctic Sunrise would not leave the area. Greenpeace entered the area to protest peacefully against Arctic oil exploration by Russian state-owned company Rosneft and U.S. oil company ExxonMobil. “We are a peaceful protest ship and have done nothing to warrant the threat of force against us. We now are leaving the area to avoid any risk to our crew, but we will not stop until offshore drilling in the Arctic is banned and will continue to shine a light on the secretive activities of oil companies in the Russian Arctic. We won’t be intimidated into silence,” said Christy Ferguson of Canada, Greenpeace Arctic campaigner aboard the Arctic Sunrise. 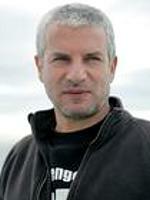 “You are acting to defend the oil industry; we are acting to defend the Arctic,” said Ferguson. The ship will leave the Northern Sea Route today, but because the Arctic Sunrise is a Dutch-flagged vessel, Greenpeace International will call on the Dutch government to consider a legal complaint against Russia’s violation of international law of the sea and freedom of expression. “One wonders whether the executives at ExxonMobil or Rosneft approve of this heavy-handed response, which will surely damage the public perception of Arctic drilling even further,” said Ferguson. “Clearly, it was not the construction of the Arctic Sunrise that was in question. The denial of entry was a clear attempt by Russian authorities to stop us from exposing the truth of what the oil industry is doing in the Kara Sea,” wrote Litvinov. “Rosneft, in a joint operation with ExxonMobil, is preparing to drill in an illegal concession that extends into a wildlife reserve, home to polar bears and a variety of marine mammals and Arctic birds,” Litvinov wrote, referring to Russia’s Arctic National Park, established in June 2009. It covers a large and remote area of the Arctic Ocean, the northern part of the island of Novaya Zemlya and Franz Josef Land. Defying the Russian refusal to grant the ship entry, the Arctic Sunrise entered the Kara Sea on Saturday, encountering a seismic exploration ship, the Geolog Dmitri Nalivkin. This ship was close to the island of Novaya Zemlya, used as a Russian nuclear weapons test site for 40 years until 1990. Greenpeace and other environmentalists fear that an oil spill in this sanctuary would be devastating and could never be cleaned up. “Despite Russian laws prohibiting industrial activity in this area, the government has granted illegal drilling licenses to Rosneft and Exxon that overlap with the park’s boundaries; and those companies haven’t hesitated one bit to take up those licenses and begin making preparations to drill,” wrote Ferguson. Greenpeace says the scrutiny of environmentalists is all that keeps oil companies from gambling with the future of remote, pristine places and subjecting humanity and planet to dangerous climate change. 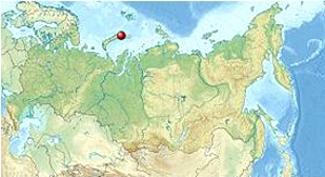 Rosneft says its Kara-Summer 2013 scientific expedition to collect data in support of exploratory oil drilling was completed on August 16 after 30 days at sea. The information gathered will be used in support of exploratory drilling in the Kara Sea’s Vostochno-Prinovozemelsky-1 license block priority areas.